Time was, to uncover the latest thinking and developments in the world of sustainability meant a lot of travel and time investment. I recall, whilst developing and driving the Mowlem Sustainability Strategy for Prime Contracting at the end of the 90’s, having to trundle to conferences in London, or to Defence Estates in the Midlands, spending a whole day in conference mode, only to pick up a few nuggets of intelligence or inspiration. Today we can pick up most intelligence via the web and social media. We use webinars and online events to share. 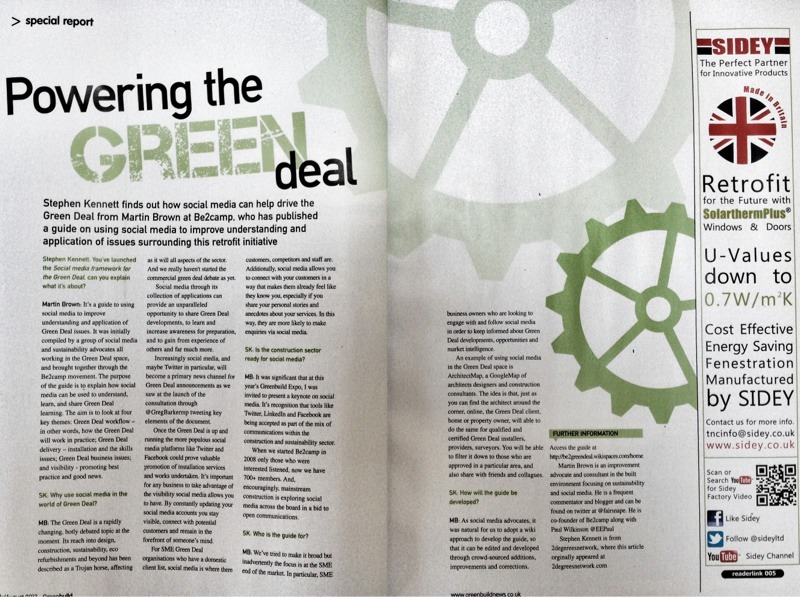 Physical events such as Eco Build, now wrapped in social media and web applications, certainly have their place. But mainstream trade fairs haven’t as yet really embraced the potential of the online world, by going completely virtual. One organisation driving the emerging virtual expo space is HyperFair – and it is their technology, that allows visitors to attend exhibition as an avatar, that the forthcoming Construction21 virtual trade fair will be using. Over two days, 14th and 15th May, EXPOC21, will enable you to visit a number of greenbuild product stands, talk to leading sustainability organisations on their stands, be inspired and talk with a number of leading greenbuild thoughtleaders, engage in panel debates and network with construction and sustainability professionals across Europe and Globally. All with a vastly reduce commitment on your time, and on your carbon emission, without leaving the office or your kitchen table! And, I think there is another important reason visiting EXPOC21 – to experience and interact with others within a virtual environment. One of the great drivers for todays industry is BIM, information management and modelling, and the associated emergence with 3D environments. Engaging with others in virtual environments, discussing proposed designs with clients and contractors and end users, whilst moving through the design itself, will become an established aspect of our industry – and a key skill to hone now. Those who have experience of Second Life, Minecraft or even Sims will feel at home, but for others, this is an experience not to be missed, and attendance as a delegate is free. Tweetchats and Twitterviews held leading up to the show, with more in show interviews to come. Disclosure: I have been supporting and advising the Construction21 team on social media and related sustainability aspects. This entry was posted in comment and tagged #EXPOC21, 3d, BIM, construction, constructionc21, eco-build, fairsnape, greenbuild, HyperFair, Minecraft, second life, Sims, social media, sustainability, Sustainability Strategy, virtual environment on April 24, 2014 by martin brown. The listing, to be compiled by Construction21 staff based on tweeted nominations will not be a ranking but more of a community of leading thinkers, do-ers and amplifiers. Calls for nomination opened on the 11 December via twitter using the hashtag #BrightestGreenest50. Nominations will close on 24th Dec with the listing to be published on the 6th Jan. This entry was posted in comment and tagged Construction21EXPO, greenbuild, leaders, list, nominations, sustainable building, trade fair, Twitter on December 17, 2013 by martin brown. Ever-changing regulations surrounding environmental policy require contractors to re-examine business practices on a regular basis. Unfortunately, contractors are left to interpret a great deal of industry regulations on their own. Among these confounding regulations are those concerning environmental protection. Once contractors have worked their way through the legal jargon found in many environmental policies, they might feel overwhelmed about what exactly their responsibilities are. Fortunately, however, a number of services and products have been created to help eco-friendly contractors. Taking advantage of tax credits and other applicable programs, contractors can offset some of the additional costs they might incur by using eco-efficient approaches to building. If you think your customers don’t know or care about green building initiatives, think again. A February 2011 poll of Angie’s List members found that 50% of respondents plan to include green building elements in their home this year, but first they want to learn more. Educate yourself so that you will be able to educate your customer and market your services better. According to some estimates, existing homes account for 94% of buildings in the U.S. The average age of these homes is 30 years, which means they often have drafty doors and windows as well as poorly insulated walls, attics and crawl spaces. Additionally, these properties are responsible for 21% of the nation’s carbon emissions. Herein lies a huge profit opportunity for contractors who educate themselves on green remodeling and market themselves to the right crowd. Draw up window plans that take full advantage of passive solar energy and help maintain proper indoor temperature. Contractors should always verify that all windows are strategically placed in beneficial locations. This is a great example of implementing inexpensive, eco-conscious design that has a real impact on sustainability. The cost of renewable products like solar platforms decreases as the technology gains traction with the buying public. Installing new products in today’s construction projects will play a large role in increasing eco-friendly building and, in turn, drive down costs. Consider that building a completely new structure using eco-friendly processes might be easier and cheaper than retro-fitting an existing structure that has inherent design flaws. Contractors who take advantage of green building will not only save money over the long haul, but also promote health benefits from building structures without toxic, energy-wasting materials. What do you do – do you have any tips for improving green build? This entry was posted in comment, construction, green buildings, Guest Blogger, housing, legislation, refurbishment and tagged eco-refit, greenbuild, greendeal, guest blog, remodelling, surety bonds on May 30, 2011 by martin brown. Heres an interesting article that Google alerts brought to my attention: Future green construction may follow European models in the Portand Journal of Commerce. As the building industry searches for the next big thing, the likelihood increases that builders, developers, architects and engineers will continue pushing the boundaries of what constitutes sustainable design – and they may look to Europeans for leadership. But as the article unfolds it does mean Europe… ie Germany, Serbia, and Scandavia …. but not the UK ? It is hard to see how these comments sit with the current UK industry opposition to zero carbon and improved airtightness requirements. Could UK designers loose out to EU designers on the international stage? This entry was posted in construction, green buildings, sustainability and tagged greenbuild, zero carbon on January 27, 2009 by martin brown. Add into this debate the cost of green build, the perceived added cost of building sustainability (not only in design but also in local labour, local materials) and there starts to appear a no brainer. I use the word perceived on purpose – there are affordable new homes being built to good sustainability standards at next to no additional costs – such as the GreenGuage homes at Lingwood . But why do we waste 30% on one hand and complain about additional costs to build green on the other? …and of course lead to lower construction cost , a resilient and better fit for purpose, people and planet sector. This entry was posted in comment, sustainability and tagged Bid to Win, greenbuild, Lingwood, MUDA, waste on November 21, 2008 by martin brown. Over 13000 delegates, 100 speakers and 380 exhibitors are expected at West Coast Green, the world’s largest residential green building conference, in San José this September. The event, that will be a green zero-waste conference, will also include live blogging, live broadcasting and plenty of pre-conference previews and profiles through the online San Fransisco Chronicle. We live in an exciting time in the green and healthy building movement. At no other time in history has the profound effect of the built environment gained so much public prominence. Now its time to discover what is emerging, envision the future and take the next bold steps. isite has highlighted the green build movement in the USA many times, attempting to draw comparisons and lessons for the UK built environment sustainability agendas, and will follow the build up to this one and hopefully relay live blogs and webcasts during the event itself to UK isite readers. This entry was posted in blogs, events, green buildings, housing, News and tagged greenbuild, West Coast Green on April 2, 2008 by martin brown.